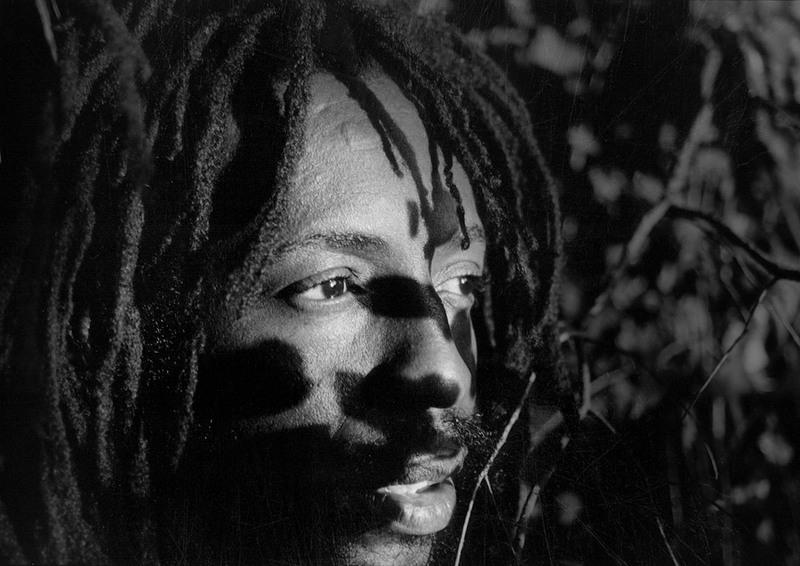 Photo Snagga Puss aka Mr Balance black and white photo shot by Floyd Celluloyd for Innermann a decade of reggae photography. Please respect the copyright. Do not use the photos without written permission. Born Norman Suppria, 19 March 1961, Kingston, Jamaica, West Indies. Suppria was one of 16 siblings raised by his mother in the ghetto of Arnett Gardens, an area documented in the Wailers hit "Concrete Jungle". He began chanting on the local sound systems performing as Dickie Ranking and by the early 80s relocated to New York where he pursued a career as a rapper. By 1992 he returned to Jamaica, although as Dickie Ranking he was regarded as being "past it". Inspired by the Hannah Barbara cartoon series Yogi Bear he chose to mimic the character Snagga Puss and adopted the name. In 1992 he was given the opportunity to perform at a children's show where he wowed his audience with his impersonation of the character over current rhythms. The formula worked and Patrick Roberts of Shocking Vibes took the DJ into the studio to perform "Can't Cook", "Ex-Lover" and "Merle". By 1993 Snagga Puss was enrolled to perform alongside Freddie McGregor for an updated version of the Justin Hinds' hit "Carry Go Bring Come". The track was produced by Gussie Clarke and topped the reggae charts around the world. The success led to another combination; "Give It Up" performed alongside Junior Tucker and an advertising contract promoting milk products. The DJ released his official debut, Whap Dem Merlene, dedicated to the Jamaican athlete Merlene Ottey and he inspired a new dance craze with the sublime "Tatie". Notable hits from 1995 included, "Girls Roll Call", "Love Bug" and the introduction of a new cartoon style with "Woody Woodpecker", previously covered by Dillinger. Snagga Puss maintained his profile through to the millennium touring with Shocking Vibes, introduced the Urkle dance (a reference to a character in the US sitcom Family Matters) and began mimicking another cartoon character, Popeye.